Stainless steel is an attractive material for use in kitchens, but it is not especially durable because it is easily scratched. Most people choose stainless steel because of its clean finish, so a dull, scratched surface is not what they bargained for. A dull surface can be renewed, but scratches are inevitable. Polishing and buffing can restore the shine and help diminish the scratches. 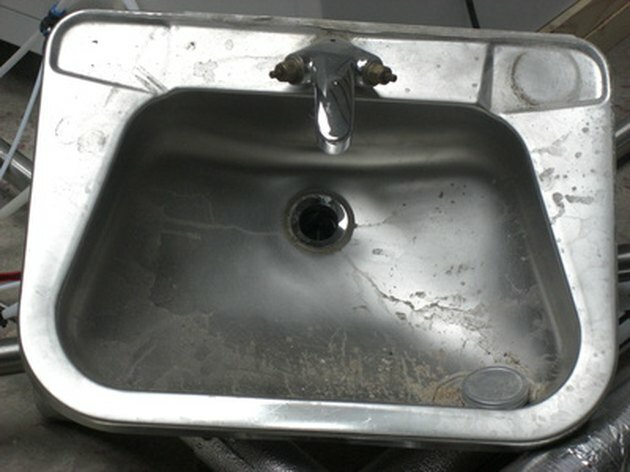 Polishing an old stainless-steel sink can make it look like new again. Remove all dishes and leftover food and rinse the sink. Spray on the cleanser and wash the sink. Dry the sink with a clean cloth. Dab the sponge into the polish and apply the polish to your stainless-steel sink in a circular motion. Let it sit for three to five minutes. Buff off the polish with a microfiber cloth, using a circular motion. Continue to buff the sink with a new clean, dry microfiber cloth. Clean the sink daily with window cleaner and a microfiber cloth to maintain your sink's shine. Sherita Smedley is a freelance writer whose work often focuses on women's issues. She teaches English at Central Texas College, and her short story "The Hour" was published in "The GNU Literary Journal." Smedley holds a Bachelor of Arts in History from Valdosta State University and a Master of Fine Arts in Creative Writing from National University.